We’d love your help. Let us know what’s wrong with this preview of What a Waste by Claire Eamer. What a Waste! answers the question: when we throw something away, where is “away”? Ever since cave people cracked open seafood shells for dinner, humans have produced garbage, and we’ve had to figure out what to do with it. What a Waste! explores the history of garbage from earliest times to today, covering subjects including dumps, human waste, water pollution, “problem” What a Waste! answers the question: when we throw something away, where is “away”? Ever since cave people cracked open seafood shells for dinner, humans have produced garbage, and we’ve had to figure out what to do with it. What a Waste! explores the history of garbage from earliest times to today, covering subjects including dumps, human waste, water pollution, “problem” garbage, and modern “throwaway” culture. From islands made out of 5,000-year-old garbage in the Florida Everglades and sophisticated waste-disposal systems in ancient Pakistan to “fatbergs” the size of a city bus in sewers today, What a Waste! delves into the fascinating, weird, and often disgusting world of garbage, and shows why it’s a growing problem. Creative solutions are showcased, like Repair Cafés to fix broken items, grocery stores that specialize in “imperfect” fruits and vegetables, and filtration systems in Kenya made from discarded water bottles. With an inviting presentation including hand-lettering and humorous illustrations, this book will both educate and entertain young readers. To ask other readers questions about What a Waste, please sign up. What a Waste: Where Does Garbage Go? 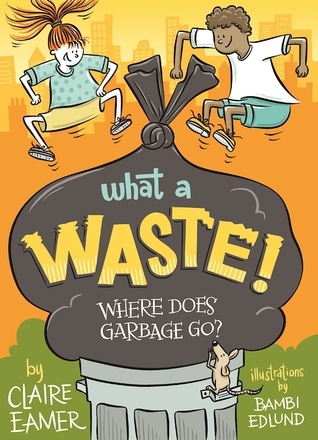 is a book that teaches everything you want or need to know about garbage. -Garbage we create in the growin What a Waste: Where Does Garbage Go? is a book that teaches everything you want or need to know about garbage. The book helps children understand that foods aren't necessarily bad because of the date on the packaging. I think this is so important because best by/sell by dates and expiration dates mean different things kids might not understand. The fact that a third of our food is tossed out yearly is alarming! As long as humans have been around, there has been garbage. A history of garbage is given as well as the current problems, from large greasy clots in sewers to plastic islands. There is plenty of gross out science and lots of awareness of the problems we face. Along with the problem are innovative people who are finding solutions, like th 'What a Waste: Where Does Garbage Go?' by Claire Eamer with illustrations by Bambi Edlund is a book for young readers about garbage and the problems it creates. Don't think it strange that I loved this book. I did! It was informative, entertaining, illuminating, and quite frankly brilliant. Who knew that waste could be explored so creatively? I certainly didn't. I'm so glad that I was given a chance to review this title. This is the type of book that I would add to my keeper shelf in my home library. I see so many ways of using it with my family for educational purposes. I think anyone who reads this will raise their level of consciousness about waste a Don't think it strange that I loved this book. I did! It was informative, entertaining, illuminating, and quite frankly brilliant. Who knew that waste could be explored so creatively? I certainly didn't. I'm so glad that I was given a chance to review this title. This is the type of book that I would add to my keeper shelf in my home library. I see so many ways of using it with my family for educational purposes. I think anyone who reads this will raise their level of consciousness about waste and waste management. Bravo! Other: Not everyone will appreciate the genius of this book. Still, there is so much value in this little treasure. This was an interesting read. It is very comprehensive but still fun. Plus the little info,bits are great. I will forever remember what “pure” is. I love that the book is based on two questions: what is garbage, and what is “away”. The this books sets out to answer those questions. A great book for all library collections. Garbage has always been produced by humans - though the amount of it is defnitely going up in modern times! Archaeologists look at the garbage left by prehistoric civilizations to better understand how the lived, and some day the same may be done by future scientists trying to understand more about our generation. Different sources of garbage are discussed in detail - including food waste, industrial waste, plastic waste, and the issue of old electronics. Issues with landfills and dumps are discu Garbage has always been produced by humans - though the amount of it is defnitely going up in modern times! Archaeologists look at the garbage left by prehistoric civilizations to better understand how the lived, and some day the same may be done by future scientists trying to understand more about our generation. Different sources of garbage are discussed in detail - including food waste, industrial waste, plastic waste, and the issue of old electronics. Issues with landfills and dumps are discussed, and also alternatives such as recycling and repairing. The book is engaging, with interesting stories and examples given. The illustrations are colorful and add a lot to the story. Finally someone wrote a book about a question that I had for a long time! The language is super accessible and easy for kids. The amount of research involved is amazing! The illustrations are beautiful. I particularly like that each chapter is divided into small "articles", it makes it for a lighter read, not too heavy on the scientific aspects. It also presents day-to-day examples of how garbage surrounds us all. Thanks to NetGalley and the publisher for providing an advance copy of this book. This book is so informational and well written. Where our garbage goes, however, is a very deep issue to think about. We recycle and are thoughtful about reducing our footprint but I ultimately had to stop reading the book, it was making me dwell on the issue and have a grim outlook on my children's future and their potential children. Comprehensive and kid-friendly treatment of the subject of waste including past, present and future. It is also filled with stories of people/nations that are making a difference to address this important but often hidden issue. This book was SUPER informative for the size - only 77 pages. I learned so much and it really opened up my eyes to the scary amount of waste in this world - but it also offered a lot of solutions or ways to greatly reduce or greatly reuse waste. Brilliantly researched with fascinating "who knew?" information. Simply and clearly written. Although it's aimed at kids, it's readable, enjoyable and educational for adults, too. I'm a writer of non-fiction for kids, mainly science and a little history. My books are published by Annick Press and available through all the usual commercial distributors, including major online bookstores. I also write children's magazine articles, popular science articles for adults, and do a variety of contract writing, mostly related to science. "